In the distant future... on a desert planet... there is a legendary gunman. His name is Vash the Stampede. A gunslinger so dangerous, a $60,000,000,000 reward has been placed on his head. 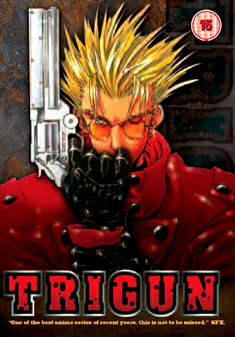 Vash, also known as the Humanoid Typhoon, has been credited with the destruction of several towns, but miraculously, there is no record of him ever taking a life. However, only two things ever happen to those who catch up to Vash - they either crawl away wounded (mostly from self-inflicted damage), or they stagger away in disbelief that such a dork could possibly be the man they are looking for!